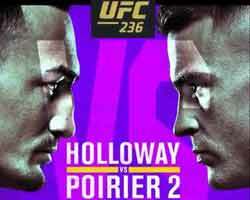 Review: 2013-05-25, good second part of the fight between Omar Narvaez and Felipe Orucuta: it gets three stars. Omar Andres Narvaez (38-1-2, 20 KOs) entered as the No.3 super flyweight in the world while Felipe Orucuta (27-1-0, 23 KOs=82%) entered as the No.11. Narvaez vs Orucuta is valid for the WBO super flyweight title; they also faced each other a second time on September 19, 2014 (=Narvaez vs Orucuta 2). Watch the video! Review: 2012-12-15, two stars for the fight between Omar Andres Narvaez and David Quijano. “El Huracan” Omar Andres Narvaez (37-1-0) entered as the No.4 super flyweight in the world while David Quijano (15-2-1) entered as the No.45. Narvaez vs Quijano is valid for the WBO super flyweight title. Watch the video! Review: 2012-10-20, even with three knockdowns and a good seventh round, the fight between Omar Narvaez and Johnny Garcia isn’t worth our three stars. Omar Andres Narvaez (36-1-2) entered as the No.4 super flyweight in the world while Johnny Garcia (16-3-1) entered as the No.8. Narvaez vs Garcia is valid for the WBO super flyweight title. Watch the video! Review: 2012-04-21, pleasant fight with a good pace between Omar Narvaez and Jose Cabrera: three stars (fight ended by unanimous decision). Omar Andres Narvaez (35-1-2) entered as the No.5 super flyweight in the world while Jose Cabrera (20-2-2) entered as the No.29. Narvaez vs Cabrera is valid for the WBO super flyweight title. Watch the video! Review: 2011-10-22, very technical fight between Nonito Donaire and Omar Andres Narvaez but it was not as spectacular as we expected: two stars. 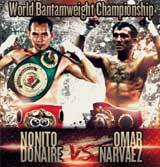 Donaire defeated Narvaez by unanimous decision retaining his WBC and WBO bantamweight titles. Nonito Donaire (26-1-0) entered as the No.1 bantamweight in the world while Omar Narvaez (35-0-2) entered as the No.1 super flyweight. Watch the video! Review: Omar Andres Narvaez (23-0-2) for the tenth time defended his WBO flyweight title (won in 2002 against Adonis Rivas), but this time the fight does not take place in Argentina, but in France, homeland of his opponent Brahim Asloum (21-1-0). In the second round Narvaez knocked down Asloum but the French continued to fight: very exciting bout, four stars! Watch the video! Review: 2011-04-15, good fight between Omar Andres Narvaez and Cesar Seda. Both boxers were undefeated, but Narvaez succeeds in winning the fight and in defending his WBO super flyweight title against the dangerous and determined Seda. Watch the video!